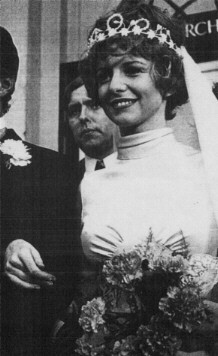 RECOGNISE the bride? On actor Richard Warwick's arm for Tuesday's Half Hour Story is (of course) Jane Asher. He plays Micahel; she plays Elaine. The story: The Casting Session. And the 1930's wig hiding the long Asher hair? "Nobody would ever persuade me to cut off my long hair," said Jane, "but I'd love one of these wigs. I'm mad about the Thirties' look."